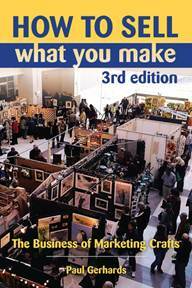 In this concise and bargain-priced volume, Gerhards focuses on the business of crafts--how to sell them at crafts fairs, galleries, and trade shows. Over half the book is devoted to the ins and outs of trade shows; as these shows are a very lucrative and often ignored vehicle for marketing and selling crafts, this book is an invaluable source for all artisans. The last section covers the basic paperwork aspects of a small business as well, and four appendixes cover trade show promoters; a calendar of trade shows; publications; and organizations.